Help maintain hip and joint function with the natural goodness of glucosamine, chondroitin, wholefood antioxidants, and eggshell membrane. 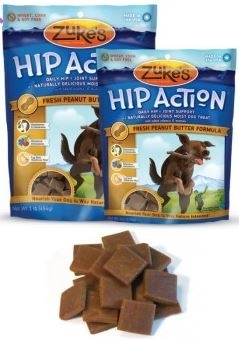 Zuke's is proud to announce that the Glucsosamine and Chondroitin in Hip Action is Made in the USA. All-natural ingredients: safe if dogs eat large quantities - like the whole bag!